Appearance size: deep 245 wide 213 high 70MM. 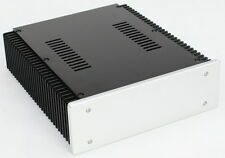 WA92 all aluminum (no hole) A power amplifier chassis. Aluminum plate thickness: 3MM. Accessories: four machine feet / screws. Color: Silver (For other colors to be customized). NE5534 AK4118 DAC Decoder Board with XMOS U8 Sub Card for Aduio DIY Support DOP DSD. - Original AK4118 NE5534. DSD1796 NE5532 Double Chip DAC Decoder Board XMOS U8 Sub Card for Audio DIY. TOPPING D30 DSD Decoder 24bit/192KHz Coaxial Optical Fiber XMOS CS4398 DAC HiFi. Nobsound®——Douk Audio. DAC / Audio Decoder. Aluminum Chassis/DIY Enclosure. Speaker Frequency Divider. Nobsound®——Dou​k Audio. Bluetooth Audio Devices. Audio HiFi & DIY. Digital Interface / Sound Card. High quality extruded aluminum and wood chassis. This is a very solid chassis which can carry heavy components with no sagging. These chassis are hand built and are made in the USA. This chassis shown has the extra polishing which is not a standard finish. High quality extruded aluminum and wood chassis. Ventilated aluminum bottom plate. This is a very solid chassis which can carry heavy components with no sagging. These chassis are hand built and are made in the USA. High quality extruded aluminum and wood chassis. This is a very solid chassis which can carry heavy components with no sagging. Version shown has Bubinga(African Rosewood) sides standard wood is Brazilian Cherry. High quality extruded aluminum and wood chassis. This is a very solid chassis which can carry heavy components with no sagging. These chassis are hand built and are made in the USA. Product description: Feature: CSR8675 Bluetooth 5.0 chip, Support APT-X APTX-HD lossless output Ultra HD format, Support 24bit/96Khz sampling rate. ​PCM5102 decoding P-hilips professional decoder chip, the direct use of analog output is also very goodperformence. Digital bluetooth Decoder chip HiFi op-amp, extraordinary sound quality. All aluminum alloy drawing process body, exquisite small, full of texture Audiophile-grade circuit design, dual active crystal, sampling accuracy is higher DC12V power supply very suitable for Home audio or Car audio system, extremely surpass the sound quality of bluetooth in-car Size: 80*72.5*30MM Voltage: DC 12V Bluetooth 5.0 receiving distance is about 10 meters. 0 ~ 220V, 0 ~ 220V ； (0.05A) 2 group ( 4-wires). Output Power: 35W (R-26). 0 ~ 6.3V, 0 ~ 6.3V ； (0.8A) 2 group ( 4-wires). Stable performance. input: 0 ~ 115V ~ 230V (3 wries). Decode Chip CS4397. Recevial chip CS8416. Main DAC board. Size 85mm(D) X 60mm(W) X 25mm(H). Imput port: one digital optical fibre input. Output port: one RCA analogy un-balance output. The kit contents ：as in the pics. Enclosure X1. Power socket X1. Front thickness 8mm. back thickness 3mm top and floor thickness 2.6mm. Radiator: H : 84mm L: 246mm, base plate thickness 5mm. It has already follow the Lampucera Oscon modification as well as using ELNA capacitors. On the back of the mainboard, there is a output for the connection of Lampizator ( tube output ). Check lampizator website. Enclosure X1. Note: the chassis will send in Bulk. Front panel 8mm. back side and Top and Base plate:3mm. >>The picture below installed with the Dual AK4497 DAC is for reference only. price for case only. case KIT x 1 set (like the picture below). Enclosure X1. Power socket X1. The output part uses a specially designed open-loop current buffer module, and all the resistors on the board use a high-precision crystal resistor.